How wide is a sonic boom? 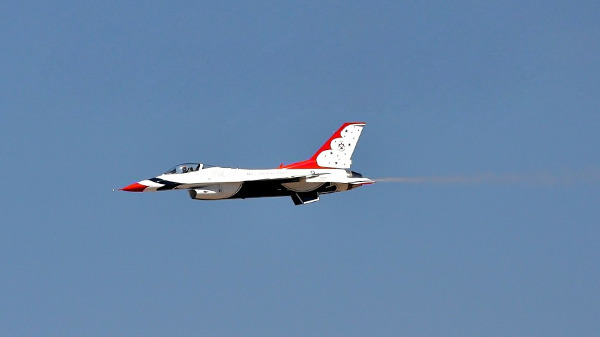 Why you sometimes hear a double sonic boom? Sonic booms occur when an object moves through the atmosphere faster than the speed of sound. We often talk about breaking the sound barrier but the sonic boom is not caused by anything breaking. 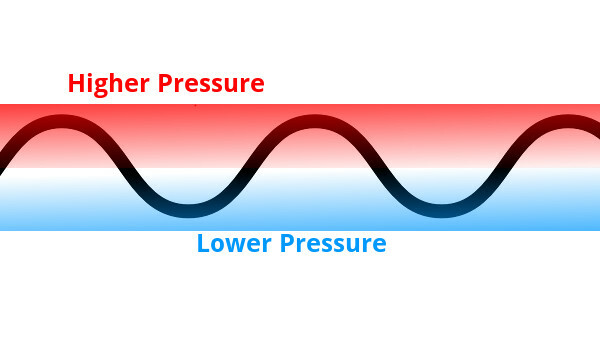 The wave illustrates the variations in air pressure. The pressure moves through the air at the speed of sound – which is approximately 340 m/s at sea level. When an object (like a plane or meteor) passes through the air, it compresses the air in front of it and creates a high pressure zone. It also creates a low pressure zone behind it. These pressure zones travel in all directions – including down to the ground. As long as the object is moving slower than the speed of sound, the pressure can disperse over a wide area. As the the object moves faster and faster, the pressure builds up and disperses over a smaller and smaller area. 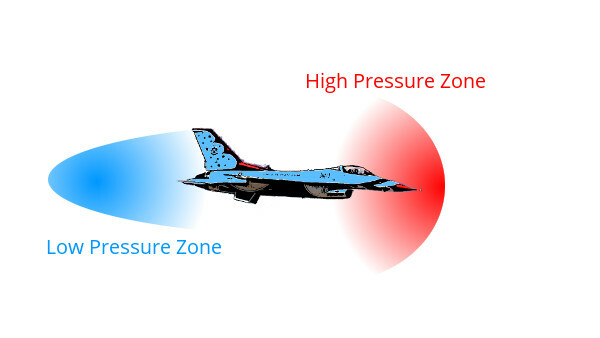 When the object is moving faster than the speed of sound, the pressure can’t disperse (because it is limited by the speed of sound) and creates a very sharp edged pressure wave which extends all the way to the ground. It is this rapid transition in pressure that we perceive as a sonic boom. This pressure wave has an N shape. The start of the N is the compressed air (high pressure) which is followed by a rapid drop in pressure and then a rapid return to normal pressure. The duration of the N wave is usually between 0.1 seconds for small aircraft (like fighter jets) and 0.5 seconds for larger aircraft (like the Concorde). 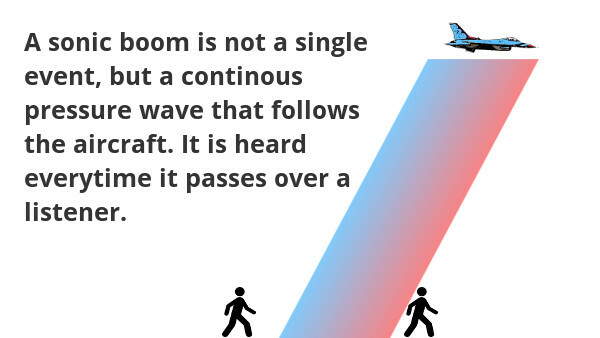 With a long N wave, two sonic booms are often heard, one at the start of the wave and the other at the end. The sonic boom is not a single event, it trails behind the supersonic object. Each observer that the N-wave passes over hears a sonic boom. 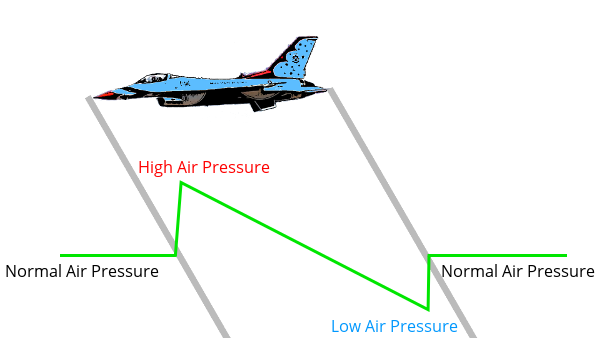 The length of the pressure wave intersecting the ground is approximately five times the altitude of the aircraft: a supersonic aircraft flying at a height of 5km would produce a sonic boom pressure wave about 25km wide behind it. A sonic boom is not a single event. It is a continuous pressure wave trailing supersonic aircraft. The speed of sound is approximately 340 m/s at sea level. Large supersonic aircraft produce a “double” sonic boom. A plane flying at an altitude of 5 km produces a sonic boom about 25 km wide.